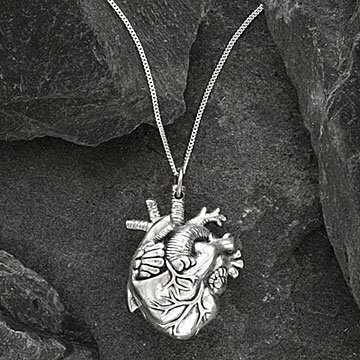 For the romantic with a fondness for the macabre, this anatomical accessory lays bare the mysterious shape of our most amorous organ: the heart. Artist Justine Brooks found her inspiration for this anatomically correct piece in her husband's profession as an ER doctor. Foregoing the typical Valentine shape, the pendant puts the heart's true form on display for all to admire. Handmade in Canada. Make it a set! Click here for the matching earrings. I wear this every day. I lost my last one when a hand made chain came loose when unloading a truck. I inmediately ordered this and the the one I lost came back! Now I have a backup. I have worked in a Cardiac Cath Lab for over 15 years and love what I do. This piece shows the detailed anatomy of the heart that I work with every day. I feel connected when I wear it. My daughter always loved hearts. At an early age she started using a heart in her signature. At one point I collected hearts to make her a necklace full of hearts. I felt this heart represented a real heart. I was right, she loved it. Her daughter and son are already fighting for it to be passed down to them. She has always had my heart and this was a real representation of my heart that I was finally able to give her, because she has always had my heart. I absolutely love this pendant. I was very pleased with the actual craftsmanship of the heart itself- very minute details and no sloppy mold marks. I find it very unique and incredibly powerful to wear. I purchased this exquisite anatomically correct heart necklace as a gift to my cardiologist to commemorate a milestone in my life journey. It really is a thing of beauty! This was presented to my wife who is an imaging technician in a cardiology department, and was truly appreciated! Anatomical accuracy was important, and I was pleased with the artist's attention to detail. This pendant is a beautiful way to improve upon the simplified heart shape we are all familiar with, and represents beyond doubt that it presented "from the heart".